Not many years after the Second Crusade, the Moslem world found in the famous Saladin a leader for a holy war against the Christians. Saladin in character was a typical Mohammedan, very devout in prayers and fasting, fiercely hostile toward unbelievers, and full of the pride of race. To these qualities he added a kindliness and humanity not surpassed, if equaled, by any of his Christian foes. The Third Crusade was caused by the capture of Jerusalem in 1187 by Saladin, the sultan of Egypt. Having made himself sultan of Egypt, Saladin united the Moslems of Syria under his sway and then advanced against the Latin Kingdom of Jerusalem. The Christians met him in a great battle near the lake of Galilee. It ended in the rout of their army and the capture of their king. Even the Holy Cross, which they had carried in the midst of the fight, became the spoil of the conqueror. Saladin quickly reaped the fruits of victory. The Christian cities of Syria opened their gates to him, and at last Jerusalem itself surrendered after a short siege. Little now remained of the possessions which the crusaders had won in the East. The news of the taking of Jerusalem spread consternation throughout western Christendom. The cry for another crusade arose on all sides. Once more thousands of men sewed the cross in gold, or silk, or cloth upon their garments and set out for the Holy Land. When the three greatest rulers of Europe - King Philip Augustus of France, King Richard I of England, and the German emperor, Frederick Barbarossa assumed the cross, it seemed that nothing could prevent the restoration of Christian supremacy in Syria. These great rulers set out, each at the head of a large army, for the recovery of the Holy City of Jerusalem. When some one expostulated with him on the means employed to raise money, he declared that "he would sell the city of London, if he could find a purchaser." The German crusaders, attempting the overland route, was consumed in Asia Minor by the hardships of the march and the swords of the Turks. The Germans under Frederick Barbarossa were the first to start. This great emperor was now nearly seventy years old, yet age had not lessened his crusading zeal. The Emperor Frederick, according to the most probable accounts, was drowned while crossing a swollen stream, and the most of the survivors of his army, disheartened by the loss of their leader, returned to Germany. The English and French kings finally mustered their forces beneath the walls of Acre, which city the Christians were then besieging. It is estimated that 600,000 men were engaged in the investment of the place. After one of the longest and most costly sieges they ever carried on in Asia, the crusaders at last forced the place to capitulate, in spite of all the efforts of Saladin to render the garrison relief. The expedition of the French and English achieved little, other than the capture of Acre. Philip and Richard, who came by sea, captured Acre after a hard siege, but their quarrels prevented them from following up this initial success. King Philip soon went home, leaving the further conduct of the crusade in Richard's hands. 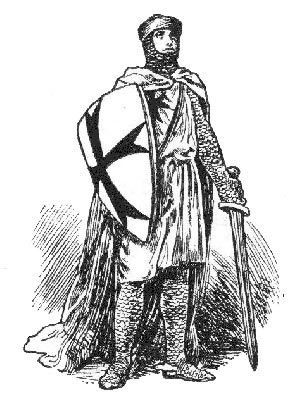 The knightly adventures and chivalrous exploits which mark the career of Richard in the Holy Land read like a romance. Nor was the chief of the Mohammedans, the renowned Saladin, lacking in any of those knightly virtues with which the writers of the time invested the character of the English hero. At one time, when Richard was sick with a fever, Saladin, knowing that he was poorly supplied with delicacies, sent him a gift of the choicest fruits of the land. And on another occasion, Richard's horse having been killed in battle, the sultan caused a fine Arabian steed to be led to the Christian camp as a present for his rival. For two years did Richard the Lion-hearted vainly contend in almost daily combat with his generous antagonist for the possession of the tomb of Christ. The English king remained in the Holy Land. His campaigns during this time gained for him the title of "Lion-hearted," by which he is always known. He had many adventures and performed knightly exploits without number, but could not capture Jerusalem. Tradition declares that when, during a truce, some crusaders went up to Jerusalem, Richard refused to accompany them, saying that he would not enter as a pilgrim the city which he could not rescue as a conqueror. The English king remained for longer in the Holy Land than the other leaders. King Richard and Saladin finally concluded a truce by the terms of which Christians were permitted to visit Jerusalem without paying tribute, that they should have free access to the holy places, and remain in undisturbed possession of the coast from Jaffa to Tyre. King Richard then set sail for England, and with his departure from the Holy Land the Third Crusade came to an end. King Richard on his return from the Holy Land was shipwrecked off the coast of the Adriatic. Attempting to travel through Austria in disguise, he was captured by the duke of Austria, whom he had offended at the siege of Acre. The king regained his liberty only by paying a ransom equivalent to more than twice the annual revenues of England. Each section of this Middle Ages website addresses all topics and provides interesting facts and information about these great people and events in bygone Medieval times including The Third Crusade . The Sitemap provides full details of all of the information and facts provided about the fascinating subject of the Middle Ages!